Today we have a guest post from Eileen Gallagher, who has a great “three hour project” for us. This would look so nice in a baby’s room. (I think they’d make interesting Christmas tree ornaments, too.) I’ll let her tell you about it, below. Hi- while I was cleaning my mom’s house out, I found a toy that was hanging in my room as a child that just made me smile. I am expecting my first grandchild in January and I thought I would make a mobile for my new grand-baby using my vintage maybe, but not quite antique, toy as a reference. It took about 3 hours but I can not be certain since I have several projects going on at once! Easy though. I couldn’t get the entire mobile in the picture, so the dowels and strings are not all seen- but you get the idea. The air dry clay is so light that the breeze catches the wings and I hope it will bring hours of enjoyment for the new baby. I chose to use primary and secondary colors- a teaching moment could be had in the future! 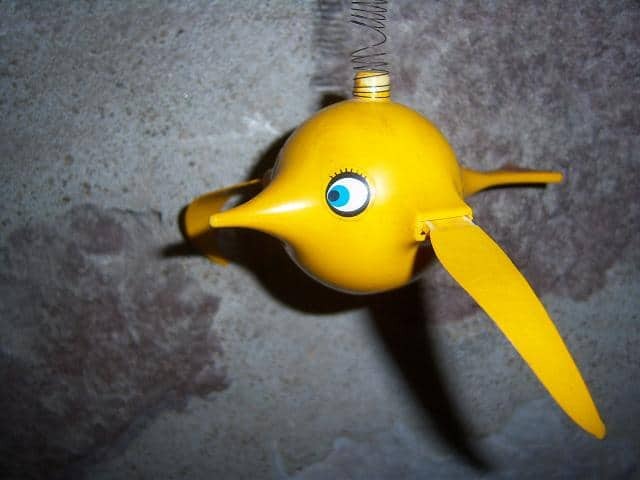 Vintage toy used as a model for the mobile. 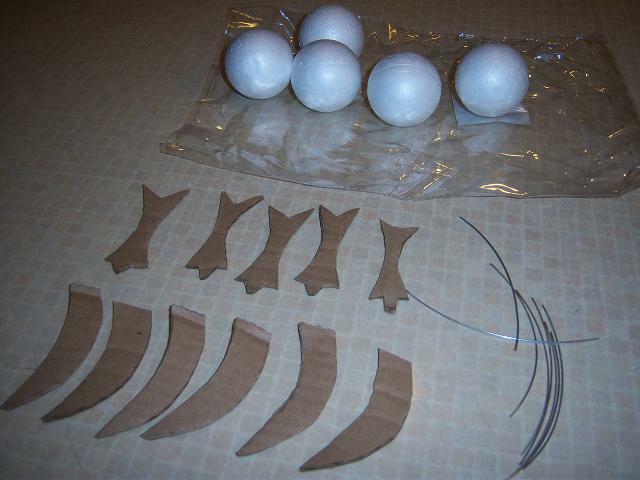 6 2″ Styrofoam balls, cardboard, tin foil, wire, masking tape, Jonni’s air dry clay, homemade gesso, paint, varnish, glue gun, thin dowels and fishing line to hang birds on as a mobile. Also a small ring is needed to hang the mobile up. Supplies for Eileen’s paper mache mobile. Cut out pieces for tail and wings using firm cardboard. Attach wire slightly longer to both and push into the Styrofoam ball in the appropriate places. Bend wings to look like a bird in flight. Then make the nose?/beak out of tinfoil and attach with masking tape. Add some tin foil around the tail to round it out. 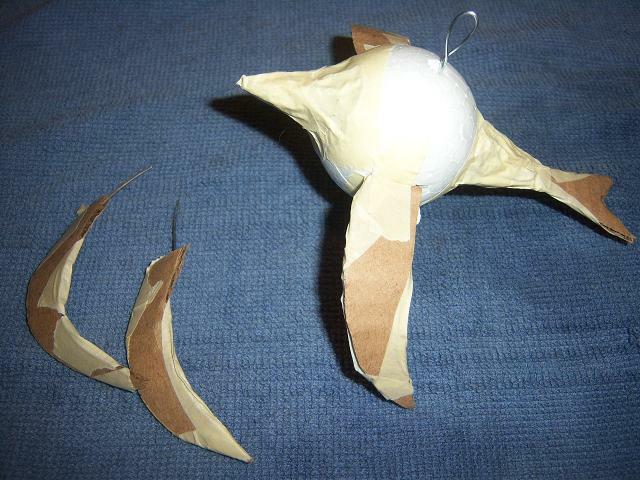 Reinforce wings and tail with masking tape. Add a small bent piece of wire on top so it can be hung on string like Jonni did her hummingbird. 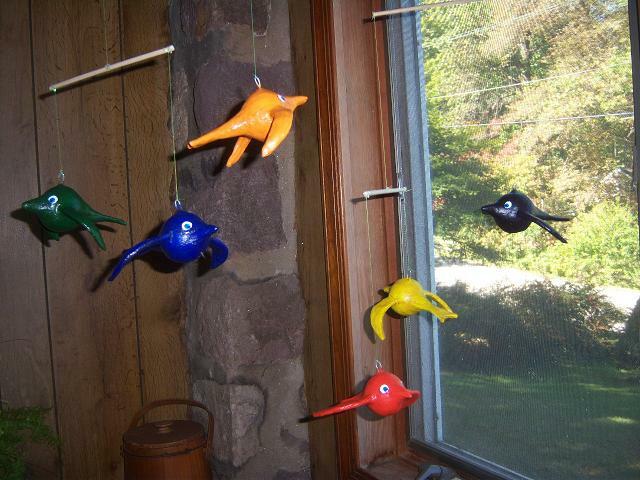 Paper Mache mobile birds ready for addition of air-dry clay. 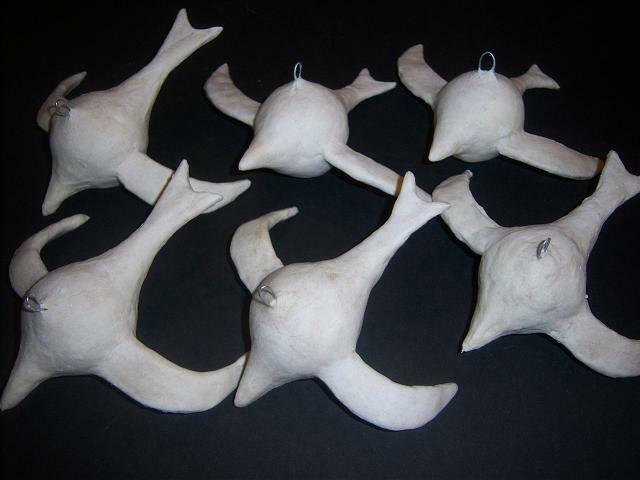 Apply air-dry clay to bird forms. Hint– do top or bottom first, let dry, then do the other half. If you try to do both at the same time it is really awkward and it comes out lumpy from handling. Air-dry clay added, ready for paint. After drying, assess for any repairs needed like cracks or separations. Repair, then gesso, paint as desired, then varnish. Using fishing line, tie to thin dowels as a mobile. Adjust and balance so it hangs correctly. 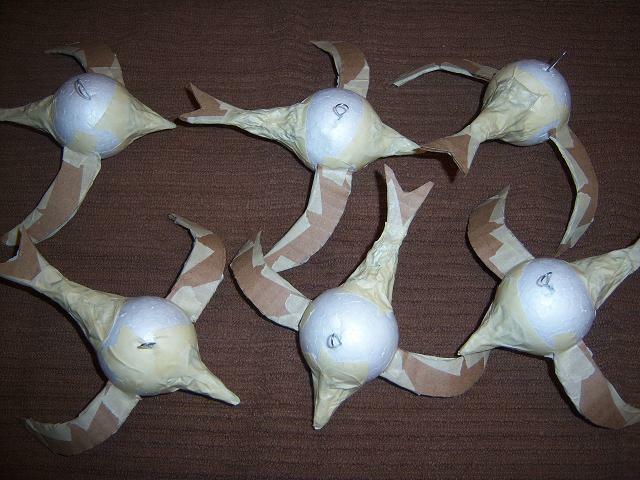 Once you have it balanced, add a dab of hot glue to keep the fishing line in place, then hang and enjoy. What a cool idea. This is great for grandmothers and new mothers to be. The only baby I have is a ten year old cat who would love to bat these all day and pounce on them. they would not last long. But, this is a nice quick and colorful way to add to a newborn’s room.